Stanislaus County Sheriff Adam Christianson blamed California’s sanctuary state law in the shooting death of Newman police Cpl. Ronil “Ron” Singh. 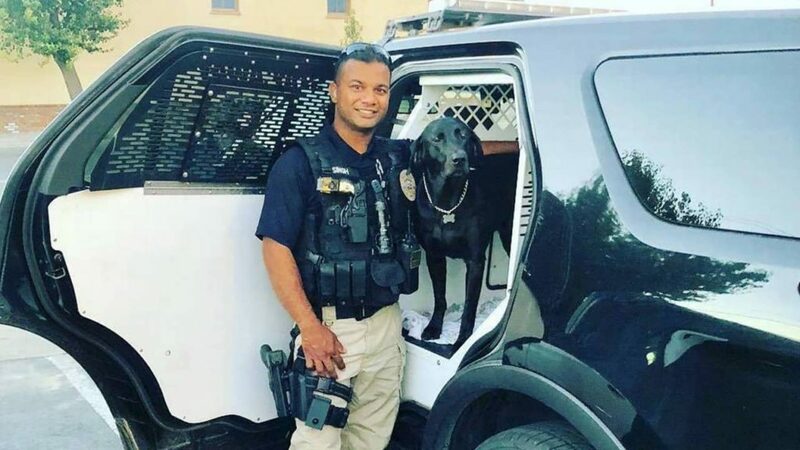 In a news conference Friday in Modesto to announce the arrest of 32-year old Gustavo Perez Arriaga, Christianson said if not for SB 54, Singh may still be alive. “This could have been preventable. Under SB 54 in California, based on two arrests for DUI and some other active warrants this criminal has out there, law enforcement would have been prevented, prohibited from sharing the information with ICE about this criminal gang member,” Christianson said. Christianson continued with his criticism. “This is a criminal illegal alien, with prior criminal activity, that should have been reported to ICE. Law enforcement was prohibited because of sanctuary laws. That led to the encounter with Officer Singh. I’m suggesting the outcome could have been different if law enforcement wasn’t restricted, prohibited or had their hands tied because of political interference,” Christianson said. Christianson said that SB 54 negatively impacts public safety. “This is not how you protect a community,” Christianson said. The Kern County Sheriff’s Department arrested Arriaga at a Lamont home in Kern County this morning. Law enforcement tracked a vehicle to that location and surveilled the scene for 24 hours, Christianson said. Christianson said two more men were arrested for misleading law enforcement: 25-year-old Adrian Virgen, who was identified as Arriaga’s brother; and 32-year-old Erik Razo Quiroz, who was identified as a co-worker. “We had them in custody. We asked them for cooperation and they lied to us,” Christianson said. Arriaga attempted to flee to Mexico, Christianson said. The Stanislaus County sheriff also said that Arriaga illegally crossed into Arizona from Mexico “some time ago.” He had two prior DUI arrests. Singh pulled over Arriaga for DUI on Dec. 26. That is when Arriaga allegedly shot and killed Singh. The sheriff said Arriaga also had known ties to the Sureño street gang. Arriaga worked as a dairy farm laborer. Passed in 2017, SB 54 limits state and local police cooperation with federal immigration authorities. “Why are we are providing sanctuary for criminals, gang members? It’s a conversation we need to have,” he said. The office of Gov. Jerry Brown, who signed the bill into law, refuted Christianson’s claim. “Contrary to these claims, California law fully permits the sharing of information on dangerous gang members,” Brown spokesman Evan Westrup told GV Wire via email. President Donald Trump said the shooting demonstrated the need for a border crackdown. Christianson did not want to go into Trump’s thoughts, but he said that border security goes hand in hand with national security and public safety. Assemblyman Heath Flora (R-Ripon) stood behind Christianson. He voted no on SB 54. Locally, Assemblyman Joaquin Arambula (D-Fresno) voted yes on the bill. His office declined to comment on Christianson’s criticism of SB 54. Kern County Sheriff Donny Youngblood said at a news conference later Friday that Arriaga surrendered without incident. Youngblood told reporters that the suspect came out of a house with his hands up after SWAT officers came to arrest him Friday morning. He added that besides Arriaga’s brother and co-worker, three others were arrested on suspicion of helping the suspect elude authorities. Youngblood says he received information that Arriaga was between Modesto and Bakersfield and heading to Mexico. Surveillance teams were set up in different communities, and authorities got a search warrant for the home where Arriaga was found. Once again, liberal dribble that completely disregards for the protection of the law bidding citizens of CA and the USA who will continue to be in jeopardy because, quite frankly, full-blown BS freebie, feel good, draconian legislation created for votes, not security! This stupidity has to stop and stop now! The SHERIFF is correct. California has thousands of illegal criminals allowed to hurt and kill innocent people.